Live Creating Yourself. : Belle: Vote on (pink!) lighting for my bedroom! Because we all have SO much fun voting on my decor (chairs for dining room, art for living room)... let's throw another poll your way! Here is what my bedroom has been looking like. Off-black walls (Farrow and Ball), grey upholstered headboard, Serena and Lily duvet that I'm mildly obsessed with, Jonathan Adler Lust Pillow... awesome awesome awesome. I've since added white velvet drapes - super luxe, cozy, and overall fantastic, and a sweet, inspiring little print above my headboard. I realized it needed that finishing touch, however, to tie it all together. And what's better than a lil' pink?! I was choosing between two pink lamps by Robert Abbey available through Euro Style Lighting: the classic Gourd and the edgy Delta. I may or may not have already decided on said lamps, but I would looove to hear what you think. Also obsessed with the white mid-century nightstand from West Elm. Methinks a set of these would be perrrrfect against the black backdrop. VOTE IN THE COMMENTS: gourd or delta?! Delta, for sure! I love that lamp! Delta. The gourd are more my personal style, but with the gif swapping them both back and forth, I definitely like the delta better for your space. Thanks Alaina! We are so excited to be part of your remodel! You already know that I am obsessed with the Deltas, but I truly think the pink gourds are the perfect fit! Can't wait to hear what everyone else chooses. I like the gourds better! I love the gourd in your space! I love the delta and have one - but it is a deep footprint for that side table so I say gourd. Check the dimension before you order! I like the Gourd better but both look great! delta is supa fly, but methinks the gourd works better in your space. I have that West Elm nightstand in the wood color on each side of my bed and I LOVE them! I thought Delta for sure -- but I think the Gourd goes better with the room. But both are great choices -- no wrong choice. Gourd if I had to pick! It adds softness and curvature to the sharp edged side table! Beautiful room BTW! Delta! It'll bring some modernness to the room. It's really coming together! Delta - or one of each! Delta! Love the faceted look and the pink looks a little brighter. Those the Delta is beautiful, the gourd fits your room better. I say the Gourd. Love the shape and it's a bit more visually interesting to me. but either will be great! I agree the delta lamp is beautiful, but the gourd lamp fits your space perfectly. so gourd lamp! i love the delta but i think the gourd would go better in your space. i can't wait to see your apartment finished! i am still in love with your bed! definitely the Delta! That is gorgeous! I vote gourd!! Classic and good curves! With the gif I thought gourd, but looking at them apart I like the Delta! I think you got the Delta! You can't really go wrong with either, but I prefer the Delta. The color, the base shape, and the shade shape--basically everything--are all just a teeny bit cooler, in my opinion. Love the way your room is coming together! Glad I think in your post you said you've already decided!! Because, I did a quick scan of these comments and it's about 50/50! Love both lamps but think the gourd lamps curvy lines provide a nice counterpoint to all the straight lines. Don't think you can go wrong with either. The Delta!! I think the pink will look awesome against those walls too! Both are great lamps. You could not go wrong with either. 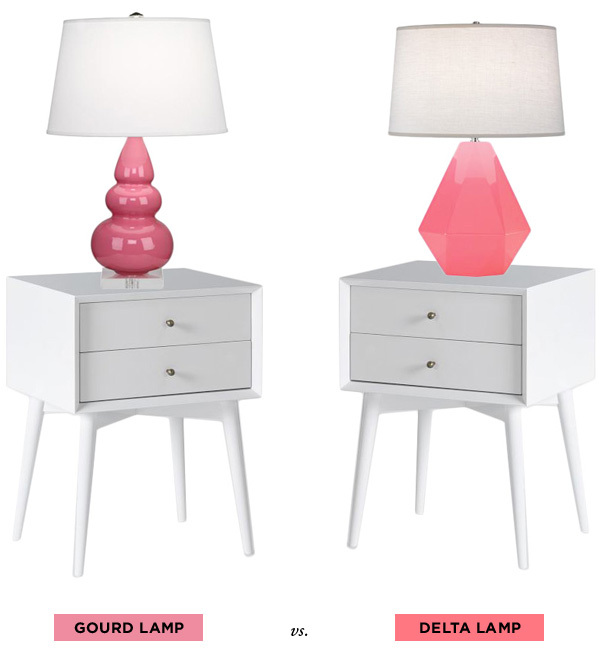 Alaina, I like the Delta Lamp but whatever you chose will look great! Delta!! Your room looks great! I suggest to mix n match the mid-century nightstand from West Elm with the modern Delta lamp, that gives an edgy but still feminine look to the room! I like the gourd because it adds contracts against the sharp lines of the nightstand. Definitely gourd my dear, tones down the angles in your bed frame. What about your boyfriend? Pink? there is something a little cheap looking about the delta.....maybe its just the picture. I say gourd! I do love the pink with the grey.